The older Bubbles gets, the more hectic I know it will get, too. We’re already looking into some tumbling classes or a soccer league for her and those practices have to be accounted for in our daily ebb and flow. I can tell that to keep up, I’m going to need two things: a lot more energy and a better scheduling system. The scheduling system is something that will take a little time to get just right. Currently I use a combination of my phone and my computer, and while that works for me it doesn’t really help anyone else have any idea of what’s going on. So my goal is to design a “family center” in either the kitchen or my office that will have our schedule, meal planning, upcoming birthdays and holidays (no more belated cards! ), and more. 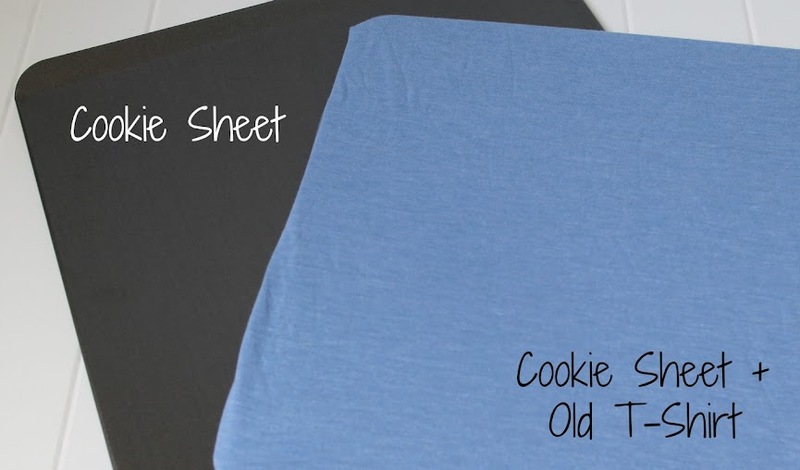 Wrap a flat cookie sheet in a piece of thin material; pull tight and secure with hot glue, glue dots or other adhesive. 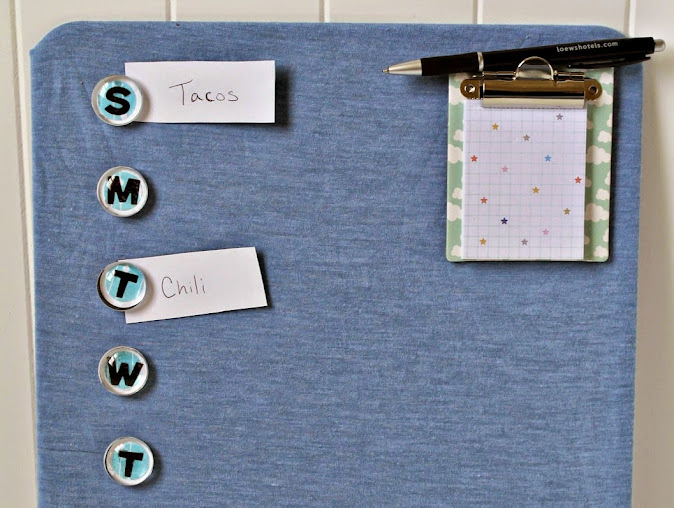 Add some round magnets to hold up each day’s menu idea. I made some DIY magnets and just added the letter for each day of the week. Include some small slips of paper or card stock. I found a little magnetic notepad that I could just pop up onto the corner of the DIY menu board. If you have a few meals that you eat regularly (like tacos, chili, spaghetti, and meatballs for us), consider printing them out on card stock and laminating them so they can be reused. Clip a pen on somewhere or even consider gluing a small magnet to one so it doesn’t get lost. 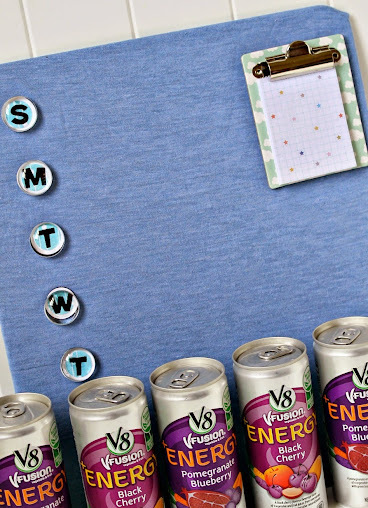 I picked up most of the supplies for the DIY menu board while I was on my weekly stock-up of V8 V-Fusion + Energy at Walmart. You can even buy your material there now, but I decided to upcycle an extra-soft t-shirt instead. Use whatever works for you! I’ll admit to loving energy drinks as one source of “get up and go”. Some of them, though, gave me the jitters or tasted a little funny or would pick me up now only to make me crash later. A few years ago I was introduced to V8 V-Fusion + Energy at a blogging conference and they have become my go-to energy drink, with me sipping on one literally every day since. 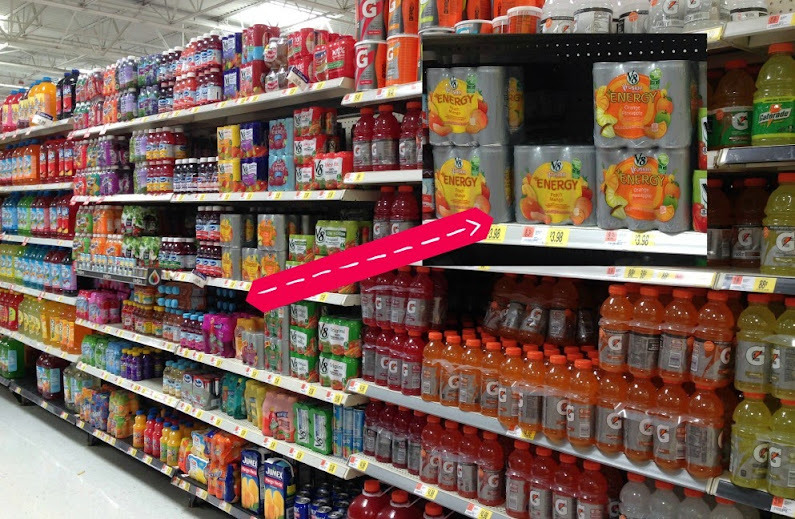 My favorite flavor has always been the Pomegranate Blueberry, but I really love the Orange Pineapple, too. They also recently introduced some new flavors, like Black Cherry which has now tied for my favorite flavor. In addition to all that natural energy from green tea, you get a combined full serving of fruits and vegetables, all from just 50 calories per 8 oz serving. There’s also a good amount of Vitamin B12 in each can, and I am a huge proponent of B12. With an easier, more family-friendly scheduling system on the horizon, I feel like our days will be a lot less hectic. And with V8 V-Fusion + Energy drinks in my back pocket (and my trunk, and traveling bag, and everywhere else I might need one) even when it IS hectic, I’ll be able to keep up. Know what else would make your week smoother and give you some energy? Winning this great giveaway! 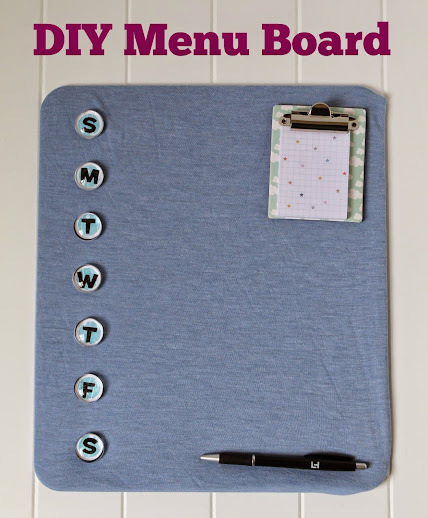 Where will you hang your DIY Menu Board?